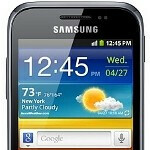 Samsung apparently is about to launch a new phone in India later this month, the Samsung Galaxy Ace Plus. This is not the high-end Samsung Ace 2, but is an entry-level device that was originally introduced in January. 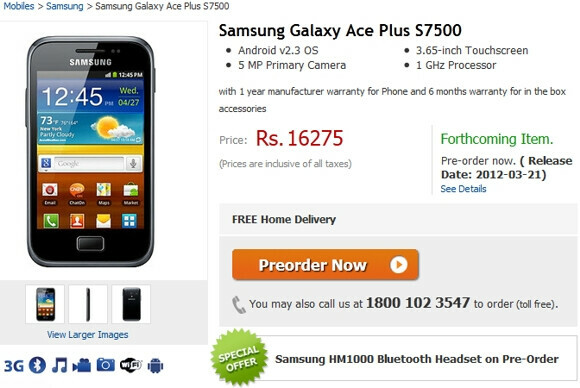 The Samsung Galaxy Ace Plus also made the trip to Barcelona last month for MWC and Indian online retailer Flipkart says it will ship on March 21st. For now though, Flipkart is accepting pre-orders for the phone, which will cost 16,275 INR ($327 USD). The Samsung Galaxy Ace Plus will come to market with a 3.65 HVGA display,and a rather meager pixel density of 158 ppi. a single-core 1GHz processor captains the ship with 512MB of RAM on board. The unit offers 3GB of native storage which can be expanded to as much as 35GB using the microSD slot featured on the handset. A 5MP AF camera with LED flash captures video at 480p (30 fps) and has an aperture size of f/2.6 along with features like smile detection and the ability to take panorama style shots. Android 2.3.6 is installed. Besides India, the Samsung Galaxy Ace Plus is also scheduled to launch in England this month where it will be available on contract or SIM-free. it looks ugly, like all sammy phones, get a break and some motivation from HTC"
With same spec you get a Nokia Lumia 710 which run smooth and fluid.